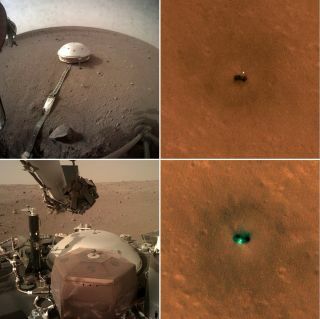 On the left are photographs taken by the Mars InSight lander: of its completely deployed seismometer at the top and of its seismometer instrument before deployment at the bottom. On the right are images captured by the Mars Reconnaissance Orbiter showing the InSight lander on the Martian surface. Email Meghan Bartels at mbartels@space.com or follow her @meghanbartels. Follow us @Spacedotcom and on Facebook.